Our online CPR Classes follow 2015 ECC Guidelines & National Emergency Response Organization Standards. We Offer Online First Aid Certification and Adult, Child and Infant CPR Recertification. Our CPR courses are specifically designed for Healthcare Professionals, and Community and Workplace persons. 98% employers accept our online CPR Certification. American CPR Care Association offers Nationally Accepted and easy-to-understand Adult, Child and Infant Online CPR certification and Online First Aid certification courses for the community, school, workplace and Healthcare Providers. 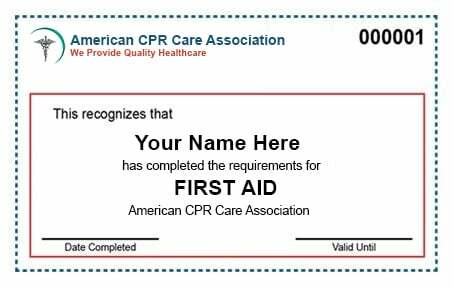 You can print your First Aid and CPR and AED wallet card instantly after passing! Your CPR Certification Card will be Valid for 2 years. The average completion time for our CPR class is between 1 and 2 hours. You may stop and re-start the CPR course at any time without loss of continuity. Every student has unlimited access to the online CPR class material for 60 days from date of registration.